Spoiler.ioHere’s a sample of the Spoiled.io text message. Game of Thrones is coming back to HBO on April 14 for its eighth and final season. Someone has created a text messaging service called Spoiled.io that will send out spoilers for $US0.99 per episode. Spoiled.io will also publish the reactions they receive from the spoilers they send out. For just $US0.99 per episode, Spoiled.io will automatically and anonymously send out a text to any phone number that ruins the newest episode of the hit HBO fantasy series. The messages will be sent after each episode airs, so it’s perfect to use for those friends who watch Game of Thrones after it first airs on TV. 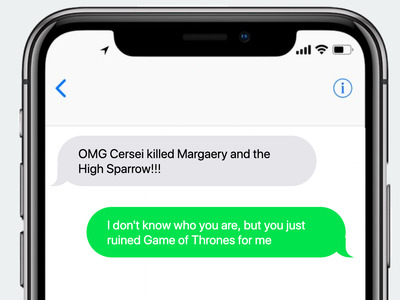 The spoiling texts service first emerged in June 2016 before the final episode of the sixth season of “Game of Thrones.” Spoiled.io published to Twitter the responses it got from unsuspecting people who had the episode spoiled for them by the texting service. This time around, Spoiled.io says it will provide those who pay for the spoiling service with a link, where they can view any responses to texts that are received. In an FAQ, the creators of Spoiled.io explain that it was inspired by a since-removed Reddit thread where a woman got back at her cheating ex-boyfriend every Monday morning by spoiling “Game of Thrones” for him. The developers of Spoiled.io, Spoiled Rotten, told Business Insider back in 2016 that the texting service was only ever supposed to be a simple side-project. But they quickly amassed “a couple hundred” users. “I don’t think we’ll be quitting our day jobs anytime soon, but the response has far exceeded our exceptions and made us question ways we could expand,” Spoiled Rotten told Business Insider.